There is still a chance to preserve the image of the storied Pokemon brand. You've had a good run, nobody disputes that. But there is no getting around the fact that Pokemon is based on the enslavement of wild animals for the purpose of bloodsport. God knows we all love it. Who doesn't love having an army of trained animals bloody the sands of the arena for your prestige and profit? But it is only a matter of time before the other shoe drops and the public at large realizes that the beloved Nintendo brand is associated with a game that is turning our pliant youth into Ron Mexicoes. You can stave off the inevitable by slapping some electric mice onto puzzle blocks from time to time, but we all know that the coal that fires the engine of the Pokemon brand is the human thirst for cruelty. I offer you a final chance to salvage your carefully-crafted reputation for the avoidance of corruption. Surely you remember Rare, they used to be in your employ. A few years ago they released the commercially unsuccessful animal husbandry simulation Viva Piñata. Nobody played this game, because it was far to complicated for children and far too adorable for the Halo crowd. The people who got the most out of it were old people immune to shame, like myself, who got sucked into the game's wonderfully deep gameplay and spent the next few weeks coming up with obscure naming conventions for our herds of squazzils and bunnycombs. (Characters in 18th century french novels, British Moralists, members of Led Zeppelin.) 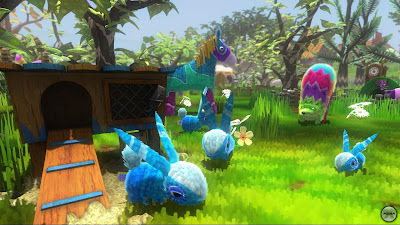 While the game had some gorgeous art design and many of the animals had some real zazz to them (you had to ignore their connection to a horrible kids' TV show) it failed to find an audience. Here are the facts on the ground. Viva is already half-Pokemon. (The other half is The Sims.) It combines the fun collecting adorable animals with the thrills of housekeeping. It is a fantastic game, and if the general public were aware of its existence it would be a smash. You already have an actual product called My Pokemon Ranch available on WiiWare, which has successfully tapped the Pokemon consumer's desire to merely wander around a fenced area populated by their squad of Pokemans. This is a game that would benefit from some actual ranching. Why don't you give the consumer a break from pitting Pokemon against each other in a contest to the death and have them facilitate some Pokeman romance through careful ranch maintenance? You work out the details, and it will sell millions. I hereby waive my usual finder's fee. What the....??!??? Don't waive your finder's fee!! You always take corporations for as much as you possibly can!! I have a friend who plays Viva Pinata, and he seems to enjoy it a lot if I'm to go by achievement score. I can't say it looked interesting. Too kiddie for me, but I am interested in LittleBigPlanet. Too bad I don't have a PS3. Hey, you shouldn't pass the game by for looking really kid-oriented. If you like games like "the sims" at all you will really, really enjoy this one. I'm also turned off by the kidsey aesthetic but it's pretty easy to get past, and once you do you will realize that the game's designers didn't really make this game for children. It's just really complicated in a good way. I'm psyched for LBP too. It's finally coming out soon. What exactly makes the TV show "horrible?" I've only seen a few episodes, but they've managed to elicit more than a chuckle out of me. It's certainly better than most of the CCG hocking crap that's on Saturday mornings.